Robert George "Bob" Uecker (/ˈjuːkər/ EWK-ər; born January 26, 1934) is a retired American Major League Baseball player, later a sportscaster, comedian and actor. Uecker is also known as "Mr. Baseball". 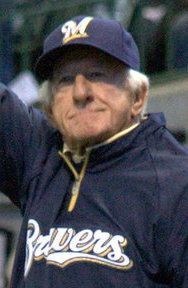 Since 1971, Uecker has served as a play-by-play announcer for Milwaukee Brewers radio broadcasts. Uecker is a member of the National Baseball Hall of Fame as a 2003 recipient of the Ford C. Frick Award for his broadcasting career. ↑ Hardicourt, Tom. "Bob Uecker says he will cut back on workload". Milwaukee Journal Sentinel. Retrieved January 30, 2014. This page was last changed on 13 April 2017, at 17:51.